In 2002, Sam came into my life by accident. I had been without a cat for 2 years since my marriage break-up and was certainly not feeling right. I had always said that a house is not a home without a cat and so with this in mind I visited the local RSPCA centre, the Claverton Dogs and Cats home in Bath. I had already made up my mind what cat I was looking for – a female tabby. I took note of his details, went to the Reception and said that I wished to take him home. The staff looked up his details and told me his name was Sam and he had been found abandoned at an empty house whose owners had left 3 weeks before. He was gradually starving to death but a neighbour had taken pity on him and brought him to the rescue centre. He was gradually improving but he was a long way from full health. They then looked at each other and asked me “Have you looked at him properly or picked him up at all?” I said no I hadn’t but that didn’t matter as I was sure he was the cat I wanted. They shrugged their shoulders and asked a young man to go and get him. Within a few minutes Sam was in the cat carrier that I had brought with me and was on the floor by my side. Sam promptly messed himself and had to be whisked off to be cleaned up before being brought back to me again. As the paperwork was being finalised, the staff member said to me “I hope you realise what you are taking on. 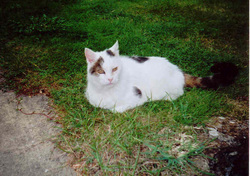 He is bad tempered, growls a lot, has a tendency to bite and scratch and is difficult to handle.” I was not fazed by that as I had raised a pair of feral kittens so knew that patience and kindness was the answer. While this discussion was taking place, Sam had messed himself again and was once again taken off to be cleaned up. I was glad to leave but did have some trepidation as I placed him carefully in the car and strapped the carrier into the car seat. I talked to Sam all the way home telling him all about his new home and explained that I would love him and look after him as best I ever could. He was quite stressed during the whole journey and, bless him, messed himself for a third time before we got home. On arrival home, I took him straight to the bathroom to help clean him up. It was then that I discovered that the staff at the home were right! Sam was extremely difficult to even get close to and fought me as best he could. I just kept on speaking quietly and gently and helped him to get clean. I then showed him where his litterbox was, called him into the kitchen to show him where his food and water were and then left him to it. I made no attempt to stroke him or touch him, just gave him his space and let him do as he wanted. A few hours later, unbelievably, he jumped up onto the couch where I was sitting and got onto my lap. I was amazed! He didn’t like to be stroked anywhere other than his head and neck so I was careful to observe his boundaries. He didn’t stay long on my lap but I was overjoyed that he felt comfortable enough to do that. But that happy state of mind didn’t last long! Over the next few days he was angry, belligerent, pacing up and down wanting to get out and actually swiped my ankles a couple of times as I walked past. I began to think it was all a big mistake but I was determined not to give up on him. I kept on talking to him and explained that I knew it must be difficult for him to be in a new environment and being unsure of what was to happen to him. He found it difficult to have me in close proximity to him. I would go and sit next to him when he was sitting on the steps between the dining area and the lounge but he would growl and swipe out at me. One evening he was busy washing and as he moved his paw over his face he let out a yelp and as I looked at him, I could see blood coming from around his eye. This was the same eye in which he had had an infection when I first had him. With great difficulty I managed to catch him and got him to the vet in a large cardboard box as at that time I was without a carrier as the last one had broken and I hadn't replaced it. He was terrified at the whole procedure but I constantly spoke softly to him, trying to reassure him that he was safe with me. He had scratched his eye but it was not serious. A week's worth of eye cream did the trick but that was a challenge in itself, trying to hold him so that I could apply the ointment. But he seemed to understand that I was trying to help him and he didn't fight as much as I expected him to. The turning point came on Bonfire Night. Sam would normally sleep on the guest bed every night, on top of a plastic bag full of Christmas ornaments that he had claimed as his own. As he was happy there, I left him to it. That night, the firework displays began and bangers were being let off. Sam shot off the bed and crawled underneath, terrified. As I looked under the bed, all I could see was a huge pair of eyes glaring at me. I got on my hands and knees and gently called him, trying to coax him out. After about 5 or so minutes, he began to crawl out on his belly very, very slowly, still obviously terrified. However, he kept coming towards me and eventually crawled under me. I then lowered myself until I was resting on my elbows and forearms and knees and Sam was just underneath me. I talked to him in a very soft voice telling him everything was OK and that I would protect him. We must have stayed like that for at least 30 minutes until at last the noise died down - my knees were killing me! Once I felt satisfied that it was all over, I raised myself up onto my hands. Sam stretched and looked up to me and mouthed a silent miaow. He was so adorable because as he did this his lip caught on his tooth so he looked as if he was giving an ‘Elvis’ lip curl. He seemed to realise that I was there to be his friend and to care for and protect him. From that moment onwards, he calmed down and we began to have a very close relationship. I was able to come home every day at lunchtimes to see him and to let him out. He was so good, as he would go out for his ‘business’ and then come back in again before I returned to work. I didn’t have to worry about him while I was away from home as I knew he was safely asleep in his bed. Whenever he came in wet from being outside in the rain, we had our ritual. He would stand in the kitchen and wait for me to dry him with his towel before he would eat or drink or go to sleep. He would just stand and wait, knowing that I was there to help make him feel comfortable and loved. Strangely he was happy for me to dry every part of him, head, back, legs, tail with a towel, but never NEVER would he allow me to stroke or pat him with a bare hand on any area except his head and the back of his neck. He had what I christened his ‘growl zone’ which was from his shoulders to his tail. From his head to his shoulders, he would enjoy a pat and would purr happily. But go beyond that point and the purr would change to a growl. So it was purrrrr-growl-purrrrrrr-growl. After a few months, we moved to another home where he could sit safely in the fields watching the sheep and enjoy being in the garden. By then my new husband from America had joined us. He and Sam would spend the day together, enjoying each other’s company while I was at work. But the connection Sam and I had was very special indeed. I was totally besotted with him even though he could still be bad tempered at times. You had to be aware of his boundaries at all times and if you didn’t cross them things were fine. Sam began to suffer from laboured breathing and he seemed to be getting fatter. We couldn’t fathom it out. A visit to the vet revealed that he was suffering from an enlarged heart and fluid was beginning collect around it in his chest cavity. (We also discovered that Sam had a fractured sternum - a very old injury, but possibly the reason why Sam did not like being picked up! There was nothing they could do about that injury now.) So, the fluid was drained off and his breathing immediately improved. He was prescribed Frusemide to avoid further fluid retention. Unfortunately the medication had little effect and over time, Sam’s breathing began to be laboured again and he began to swell. As before, the fluid was drained off. He was so brave. He didn’t fight or grow or spit. He seemed to know that we were trying to help him. Once again, the relief for him was immediate and he returned home much happier. However the vet told us that this problem would return again and again and that Sam would have to have this procedure done every time. He asked us to seriously consider how long this could go on. Just as the vet said, only a few weeks later the fluid retention started again. He was finding it difficult to carry all this extra weight of the fluid around and he would ‘plod’ as he walked. It was hard work for him. One morning, Sam went outside just after we returned from grocery shopping and after a few minutes he came back in and looked at me intently. He made the most awful sound whilst looking deep into my eyes. My gut went into knots. I knew at that moment the time had come to say goodbye. He was utterly miserable and was not living a quality life. I called the vet and asked him to come to our house as I wanted Sam to be in his own home for the last moments of his life. As soon as the vet looked at Sam he confirmed that it was indeed the right decision as Sam had also developed odema in his legs and it was obviously a struggle for him to breathe or walk. His last moments were very very painful to watch. The injection seemed to take an age to take effect and the vet had to step in again to help Sam on his way. We were utterly broken hearted. My wonderful noble friend was gone. As my husband dug his grave, for the first time ever I was able to cradle Sam in my arms and kiss his sweet face, his head, his lovely soft ears and tell him how much I loved him. I held him for a long time, rocking gently, looking in wonder at this beautiful boy who had completely stolen my heart and who had made such an impact on my life. I knew I would never be the same again. 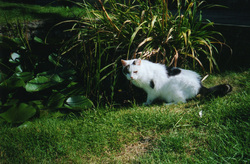 Sam died in May 2003 and was buried in his fleecy bed beneath a beech tree with a sprig of lilac to send him on his way. To this day I still mourn him, that wonderful feisty, gorgeous furry boy who finally got the love and respect he deserved when he came to be with us. We now have Sophie, who has been with us since 2005. There have been occasions when she will suddenly stare at what appears to be nothing but will follow 'it' closely all around the room. On a couple of occasions, she has suddenly shot out of her bed as if she has been touched by something or someone and then spend a long time sniffing around. As far as we are concerned Sam has visited! I dream of Sam often and feel his wonderful presence. This is especially when I have a consultation due or have just conducted one. I know he is around me and I feel he is helping me in my quest as a good animal communicator. I always ask him to help me get a good connection with whatever animal I am going to communicate with. Sam has proved to me that love never dies and I feel so blessed that I had the privilege of sharing my life with him, albeit only a short 10 months.